I know I always say that I am going to be blogging more but it is now officially one of my new years resolutions (I have writen them down and everything). To begin this year I thought I would share a couple of things. Firstly a photo from christmas which was great and a well needed relax. I got some fab presents and was spoilt as always. 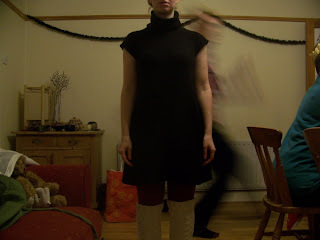 In this photo you can see two of them, dress from my parents and legwarmers from my sister. I like action shot of my brother is running in the background. I also have a new online shop which I set up just before Christmas. 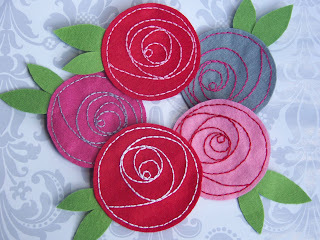 I will be selling lots of new designs, some of which will be exclusive to that shop. There is already a new size of my simple rose brooch in there which is very large indeed, a definate statement accessory (see below). ha your brother is doing some mean crazy funked up dancing there!